These Farm Heroes level 406 cheats and tips will help you beat level 406 of Farm Heroes. The objective of Farm Heroes level 406 is to achieve 100% growth and collect 46 water droplets, 64 yellow suns and 64 orange carrots. 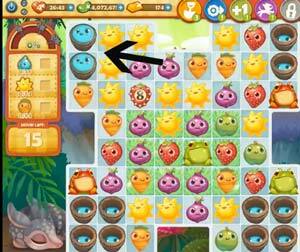 In Farm Heroes Saga level 406 you will have 17 moves to collect 40 water droplets, 64 suns, and 63 carrots. First, you want to focus on making moves next to the water buckets. When you make three matches next to one of the water buckets, you will make it overflow. Once it overflows, they will release three water droplets onto the board. When the water droplets are on the board, you will be be able to start collecting the required water droplets. If possible, try to make combinations that will hit more than one water bucket. This will fill up the water buckets and get droplets onto the board more efficiently. Throughout this level, continue to fill up the buckets until you have collected the water droplet requirement. Since there are frogs in this level that will eat up your cropsies, you want to try to make each combination worth more points. Combinations that are made on the grass will have extra point values attached to them, such as +1 and +2 point values. Making combinations with higher point value cropsies will help you to beat this level more effectively. When you make combinations that include 4 or 5 resources, these will also send out higher point values to the cropsies surrounding it. With only 17 moves, you want to make sure that you are using each move wisely. Making these large combinations will help you to collect the required resources. 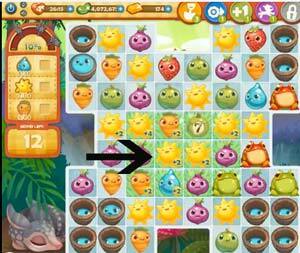 With four frogs on the board, you want to make the combinations quickly. When you see an opportunity, do not waste time because the frogs may take it away! 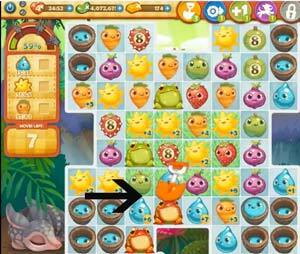 The frogs may help you to remove the random bombs and unnecessary resources that come onto the board. Pay attention to where the bombs are and how much time they have left after each move. Level 406 Cheat #3: Use boosters! Boosters may help you to beat this level. The shovel booster is a great booster to take advantage of. The shovel booster can help you to not only remove a resource that may be in your way but also help you fill up the water buckets and bring water droplets onto the board. If you are running low on moves and still need to collect some required resources, use the dog booster. The dog booster will collect an entire resource from the board. Remember that boosters do not use up any moves and they will refill on their own so do not be afraid to take advantage of them!